Home » World Peace » Will $500 Billion Make America Feel Secure? On the subject of national security, two unexpected calms lie hidden amid the headlines of conflict. One calm is in Washington, where Republicans and Democrats pretend to debate the national security budget. Yet the two plans offer identical figures for defense: $560.2 billion in the coming year and $6 trillion over the next decade. President Obama’s budget proposal, released today, offers two similar figures: a baseline defense budget of $526 billion and total estimated expenditures of $598 billion, both almost as high as the budgets for the current year. Despite the partisan rhetoric, Washington is close to consensus about keeping security spending at Bush-era levels. These concerns proved false. There were no weapons of mass destruction in Iraq. The scale of foreign terrorist plots against the United States has been far smaller than feared, and no al-Qaeda sleeper cells were ever proven to have existed. 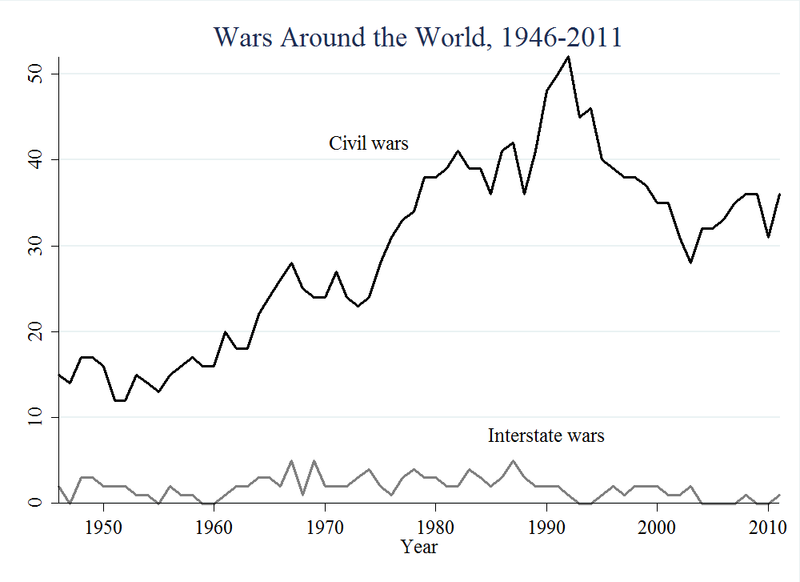 Instead of a clash of civilizations, interstate war is rarer than at any time in history. Today, no two governments are fighting one another, and there have been fewer civil wars in the dozen years since 2001 than in the previous dozen years. Data source: UCDP/PRIO Armed Conflict Dataset, v.4-2012, counting conflicts each year with at least 25 battle-related deaths. 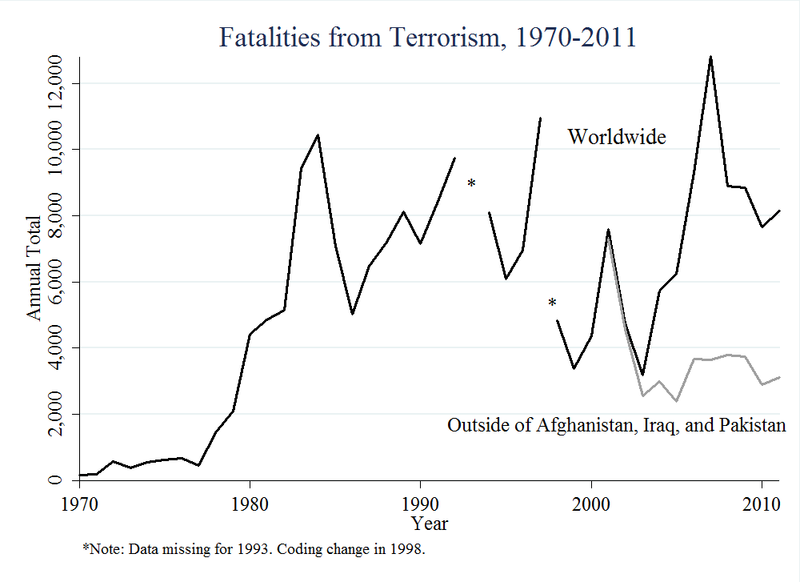 Instead of escalating terrorist violence, fatalities from terrorism actually declined worldwide, outside of three civil war zones – Afghanistan, Iraq, and Pakistan. Even taking those conflicts into account, terrorist fatalities have dropped by a third since 2007. Data source: Global Terrorism Database, START Center, University of Maryland. Washington has not taken sufficient notice of the reduction in global conflict. Instead, the bipartisan consensus on national security is trapped in policies and budgets that were designed to face far greater threats. 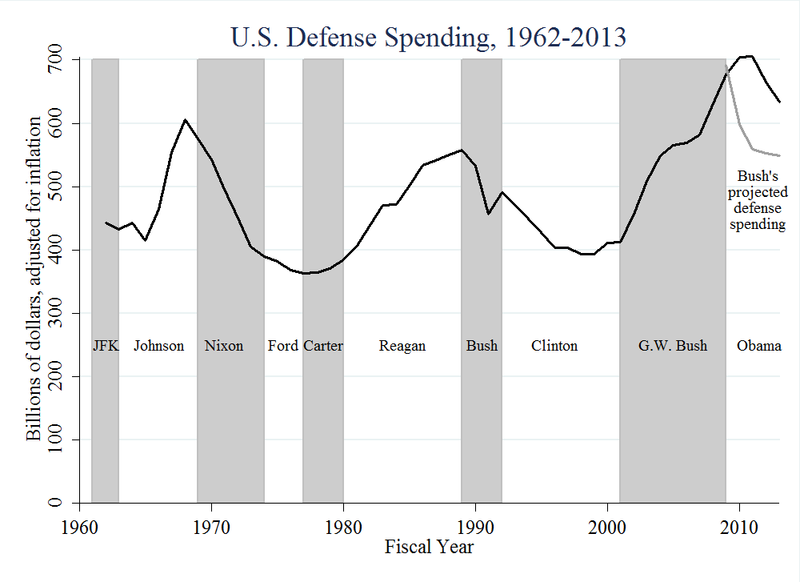 In fact, the Obama administration has already spent $336 billion more on national defense than the Bush administration projected through 2012. Data sources: Office of Management and Budget, Budget of the United States Government, Fiscal Year 2014, Historical Tables, Table 4.1, adjusted for inflation with defense deflators in Table 10.1. Bush administration projections in Office of Management and Budget, The Budget for Fiscal Year 2009, Historical Tables, Table 4.1. Republicans have a stake in maintaining America’s hypersensitivity to security, since they benefit politically from a heightened sense of threat. But what do Democrats get out of this game? Perhaps they are using national security as a covert economic stimulus program. Perhaps they share the Republicans’ hawkish “one-percent doctrine” that every potential threat, no matter how improbable, must be treated as though it were a certainty. Underlying these calculations, ultimately, is fear. Policy-makers are frozen with the fear that whoever scales back America’s security policies to match the receding levels of threat will be blamed when the next attack occurs. There will be more attacks, of course. No government will ever rid the world of violence. But maintaining a war footing in the absence of war is like buying too much insurance. It is unnecessarily costly and distracts attention from other priorities. What is worse, this permanent state of emergency feeds the sense of insecurity that it is supposed to assuage. The exaggerated sense of threat degrades liberties through extended government intrusions like the provisions of the Patriot Act. The heightened concern with Islamic terrorism contributes to American fears of Muslims, who are unfairly cast into suspicion, through no fault of their own, simply by sharing the faith of extremists. The national security consensus in Washington keeps Americans scared. Perhaps a little more conflict in Washington on national security issues would expose Americans to the declining level of conflict around the world. With President Obama’s budget proposal on the table today, let’s discuss whether national security policies should be calibrated toward the bipartisan calm in Congress or toward the global calm in world affairs. Charles Kurzman is a professor of sociology at the University of North Carolina at Chapel Hill and author of The Missing Martyrs: Why There Are So Few Muslim Terrorists.